Welcome to Gift Week 2012! This week we will be featuring a broad assortment of projects that will give you the resources you need to be fully prepared for this year's Holiday season gifts. 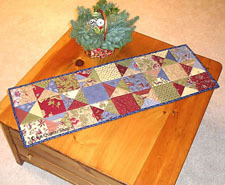 First up is one that we heard several requests for; a table runner that will make an excellent gift! 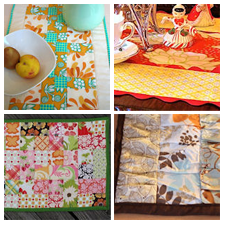 Today's table runner is by Kimberly Jolly of Fat Quarter Shop. The tutorial is clear and Kimberly provides great step by step instruction, and if you'd rather work from a printed page she provides a free downloadable pattern. Her website is also one of the best we've found for quilting supplies of all kinds and for this project and others like it, you should check out her selection of charm packs and quilt kits! Finished Size: 14" x 41"